This experiment was created by Loralee Leavitt. Please do not copy, sell, post, publish, or distribute all or any part of this material without my permission. Instead, feel free to link to this website, and to contact me with questions. Sugar water is denser than water--the more sugar, the denser. This experiment shows you how to layer different densities into a rainbow of color. Try it with Skittles (advanced) or Nerds (easier). Fill five cups with 2 Tbsp of water each. Pour the purple water into the clear glass. Hold the spoon upside-down over the purple water, with the tip of the spoon touching the edge of the bowl above the waterline. Slowly pour the green water down the back of the spoon, so that the green water does not mix in with the purple. Instead, it should float on top. Repeat with the other colors, and admire your rainbow. Fill four cups each with 1/4 cup warm water. Dissolve 1 teaspoon red Nerds, 2 teaspoons orange Nerds, 3 teaspoons yellow Nerds, and four teaspoons green Nerds (or whatever colors you like). Pour the rainbow as above. Since the water with less candy is less dense, it floats on top of the denser layer like oil on water. Unlike oil and water, your sugar water layers will eventually mix together, muddying the color. So admire it while it lasts! This was slightly disappointing with a four year old. The skittles don't dissolve easily even in boiling water. Cool idea if you have the time maybe? For me, I can microwave the cup of skittle water for about 30 seconds and the skittles dissolve; otherwise, it takes about an hour for the skittles to dissolve in the water. I agree this is one of the more complicated experiments. This was a failure not once but twice! I think the problem the first time was the candies were not completely dissolved. And the second time the colored water may have been too warm to "layer". Sorry it didn't work. 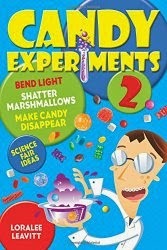 The candies do have to dissolve for it to work (otherwise the different solutions are the same density and don't layer). I've never had a problem because the water was too warm (or if I did, I didn't realize it), although I could see there might be a problem if your bottom layers were too warm and your top layers were cold (i.e. denser). My biggest problem is still from pouring the water too fast and mixing up the layers, or bumping the bowl. You have to pour the layers REALLY slowly, with a steady hand (my husband mastered the art way before I did). I tried this with my class last year, and it didn't work. Figuring that it could be user error, we tried again this year, but again it failed. You end up with a big cup of murky water with no layers- even when you give the Skittles all day to dissolve and pour as slowly as humanly possible. Disappointing! That is disappointing. It works best for me when I have a pretty short bowl or cup, so that I can control my pouring better, or when I use the syringe (as above). I don't always do it on my presentations, just because it is tricky. When I do, I make sure to have a backup set of dissolving skittles in case the first set muddies too fast. You can usually get at least one good set of layers, so that you can demonstrate the concept. So how long will the layers stay? My daughter wants to do this for her science experiement but it will need to be albe to set in the gym for a few days for display. When I leave it on my kitchen counter, I've been able to see the layers even after a couple of days, although they get really indistinct. But I don't know if I would do it for a science fair. It's so tricky to do, and science fairs are so crowded with people bumping the table, I really don't know if she'd be happy with it. Loralee, you've got lots of great ideas on this site, but I don't understand this one. When you combine two solutions in different concentrations, they are going to exchange (candy) molecules until they form a homogenous solution. You may possibly be able to get the purple layer to stay separate, simply because it's probably super-saturated to begin with. Do you have a scientific explaination for why this experiment could work? I think the only way you could get a picture like the one shown is with a freezer. Dan, you're right that the two solutions of different concentrations are eventually going to mix together. The trick to this one is to pour the top solution very slowly, so that the less dense solution floats on top of the denser one. If you pour too quickly, they mix together immediately (as you predicted). If you pour the rainbow successfully, it will stay in layers for at least a few hours, but eventually the different solutions blend together, thanks to Brownian motion, and the color turns muddy.